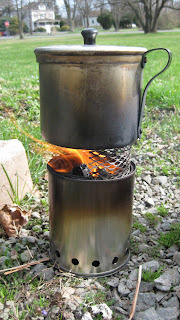 I have seen plans floating around on how to make an Inverted Downdraft Wood Gas Stove. I liked the concept but did not like the bulk of them and how high off the ground they raised the pot. One can buy a pre-built stove like the Bush Buddy but the price tends to push most people away. Even though I believe they can be custom sized to your pot so they nest inside. 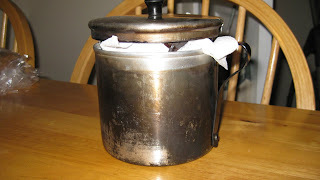 I ran into the plans to build one of these stoves on the Backpacking Light forums and realized I could make one of these stoves for under $5. I used the BPL forum instructions and also Tamrag's blog to put this together. 1 piece of mesh, I used gutter mesh that was $2 for a large strip at Home Depot. I didn't have a 1/2 inch bit, so I used a 3/8 inch bit and the results have impressed me. On a day with gusting winds I was able to bring 3.5 cups of water to a boil with a handful of wood in about 15 minutes from the time I lit the fire. The best part is the stove fits inside my IMUSA mug but is still a little tall. I am going to make another one and shorten the entire stove by 1 inch and then it will nest perfectly. I am also going to get some of the BBQ Grill paint and coat all the pieces to help keep them from rusting.